With this article we’ll be giving our reviews of the best indoor grow tents to be used to help you grow with a hydroponics setup. We’ll also be covering what to expect from grow tents, what to look for when picking one out & also helping answer some common questions about them. The Gorilla Grow Tent GGT59 is one of the largest commercial grow tents out there, designed for beginning and intermediate hydroponics growers. 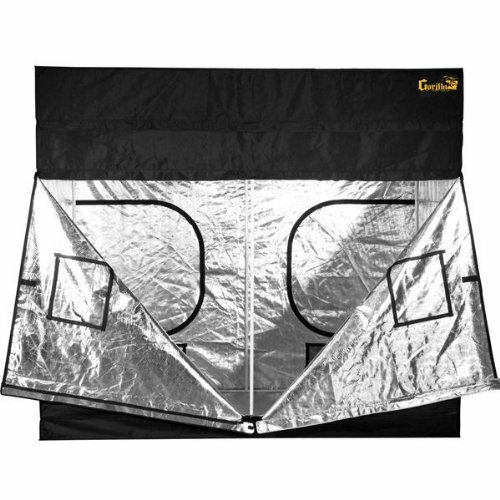 The Gorilla Grow Tent GGT59 has a solid metal structure and a signature interlocking mechanism to ensure sturdiness, ease of assembly and safety during use. Joints have easily identifiable connectors so you can set up easily on the day it arrives. When it’s time to add more grow beds and tiers to your hydroponics setup, you can just grab the free 12” high extension kit that comes free with the package. This model can be extended to eight feet all the way to ten feet if need be. This type of extensibility is certainly something we all need as growers because we not only add grow beds but we sometimes also need to add grow lights and other devices to the grow tent and that requires space. The roof of this grow tent has an infrared blocker to ensure that possibly unhealthy radiation is kept inside the grow tent. As you know HIDs and LED lights designed to help plants grow can emit these rays and it’s best to limit your exposure to them especially if your main system is going to be indoors for most of the year (or all the time). 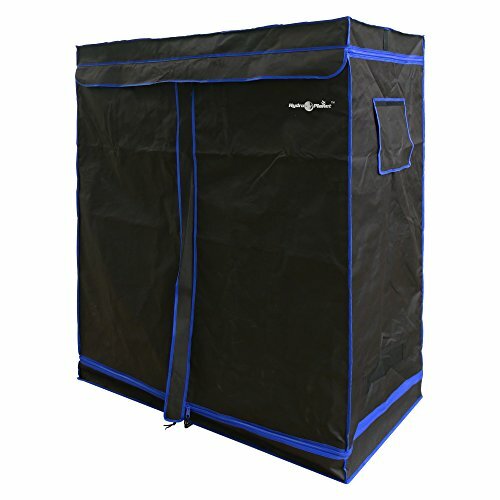 The Apollo Horticulture Mylar Hydroponic Grow Tent measures 48” x 48” x 80” and is the runner-up in our rundown of excellent grow tents for hydroponics/aquaponics. Apollo offers a 90-day warranty on its products and guarantees that you will get a complete package ready for deployment at your indoor hydroponic setup. An interesting feature of the Apollo brand of grow tents is the interior of these tents are highly reflective, thereby focusing much-needed light to the plants. These tents are also designed to be light but sturdy as they are reinforced with double-stitching and equipped with heavy duty zippers. Apollo grow tents are manufactured with one thing in mind: preserving light and maintaining a constant temperature inside. This model comes with a mylar floor and reflective layers to keep light, focused and available to growing plants. What’s truly special about Mylar film is that it is both durable and cost-saving. Mylar film has been known to reflect up to 97% of light back to plants, which means you can adjust the intensity of your grow lights and still get good results. This material is not available in generic grow tents, which means you may end up spending more on power bills if you don’t get a Mylar-lined grow tent. The Gorilla Grow Tent LTGGT22 measures 2’ x 2.5’ x 5.7’, making it a midsized grow tent perfect for beginning hydroponics growers. If you have been looking for a compact grow tent because your hydroponics setup isn’t as large-scale as you’d hope yet, the LTGGT22 is an optimal choice for beginning hydroponics growers. In addition to being made with tough material, Gorilla grow tents also have micro mesh pre-filters that prevent bugs and other pests from getting into your grow tent. This is extremely important as plants tend to attract lots of pests. Let your grow tent protect itself from pests so you can expect better yields, better growth over time. EZ-View windows have also been added so you can easily inspect your plants from outside. This reduces your exposure to infrared radiation and heat, so you can perform visual checks easily without having to step into the controlled environment of the grow tent. 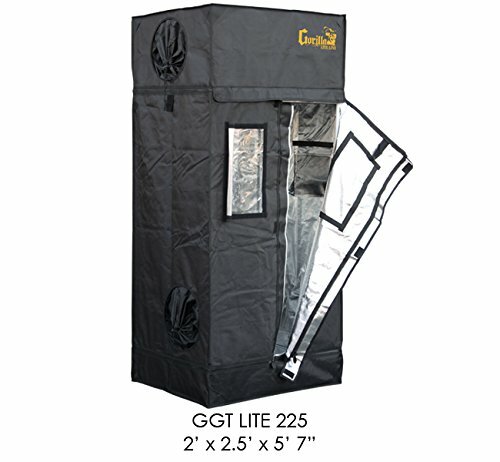 The LTGGT22 grow tent can be extended vertically by a foot with the aid of adjustable extension poles, which are sold separately. It’s made with a tough canvas material that is meant to resist tears, ensuring solid use for years. It also comes with a solid, interlocking frame that’s easy to assemble/disassemble, so you can definitely transfer your grow tent to another location if you need to. 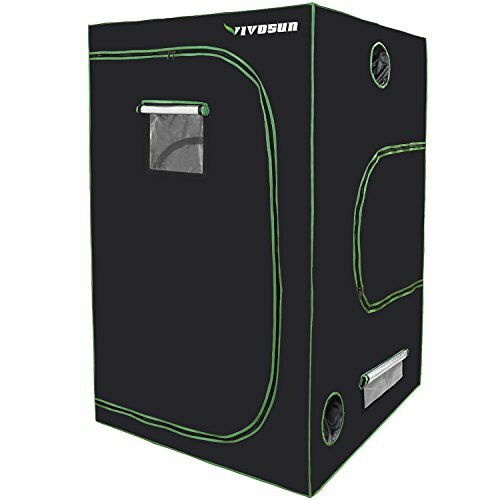 The VIVOSUN Mylar Hydroponic Grow Tent is yet another optimal choice for beginning hydroponics growers because of its size and excellent features for growing plants indoors. The VIVOSUN Mylar Grow Tent is manufactured with Mylar film, a special type of material that can reflect close to 100% of light. The reflective capability of a grow tent is important because it can spell the difference between savings and disaster. A grow tent with high reflectivity doesn’t absorb light – it redirects light back to the grow beds, where it is needed the most. This means you will likely spend less on power using a grow tent with Mylar film. The VIVOSUN Mylar Grow Tent is manufactured with the toughest 600D canvas that is virtually tear-proof. Seams and corners have been double-stitched to increase the durability of the entire grow tent and to prevent light from escaping. Specially-finished, sturdy metal poles support the structure from the ground up, and you won’t have any trouble with installation as these poles have been finished to provide extra ease during assembly. The poles come with tool-free clips that snap and lock together quickly for the fastest assembly ever. In the long term, you won’t have any problems monitoring the growth of your plants as large windows allow you a full view of the inside of the tent at any time. Close the panel over the windows and you have excellent light-blocking again from within. The iPower Hydroponic Grow Tent is a mid-sized grow tent built for performance. Its solid metal tubes, combined with its easy snap-on technology ensures quick assembly and disassembly and is adequate for most aquaponics and hydroponics projects. The complete package includes one iPower grow tent, one Mylar floor tray, filters straps and a user manual for easier assembly. Like other more expensive brands, the iPower grow tent has also been reinforced with double stitching to ensure high durability and long use. Thick canvas material ensures continuous use through many growing seasons, as well as protecting from wear and tear from being placed over a metal structure. The inside of the grow tent is lined with heavy-duty Mylar material that can reflect up to 95% of light from within. Huge power savings await the hydroponics gardener with the iPower grow tent. Did you know that Mylar film doesn’t just help you save on power, but it also keeps your plants from being infested by insects? Mylar film is a tear-resistant material and also resists bites and nips from insects. Pests can’t get in and at the same time, the impermeable nature of Mylar film also prevents odors from invading your indoor space. This is extremely important when you’re gardening indoors! The Hydroponic Extra-Thick Canvas Grow Tent isn’t just cost-effective and lightweight – it also has all the greatest features of the more expensive brands! For the price, you would expect little from this grow tent. It’s easy to think – hey, maybe this tent will fall apart in a day or two. But the reality can’t be farther from the truth. Take a peek inside the Hydroponic Extra-Thick Canvas Grow Tent and you will realize that it has been lined with the same sturdy material known as Mylar film, which prevents light from escaping and also helps keep pests out from your grow beds. 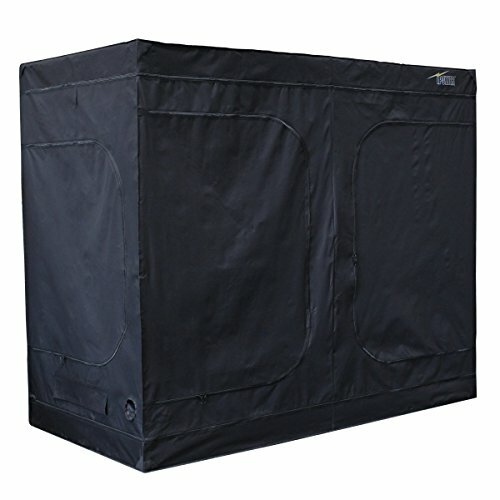 The grow tent measures 60” x 31” x 80”, which makes it perfect for intermediate hydroponic projects that require more grow beds and more lights. You will be able to easily position your grow lights with more vertical space inside the grow tent. The canvas material itself is washable so if ever nasty spills should occur and questionable odors arise, you can wash the canvas, dry it and drape it over the sturdy metal frame again to continue your indoor gardening. 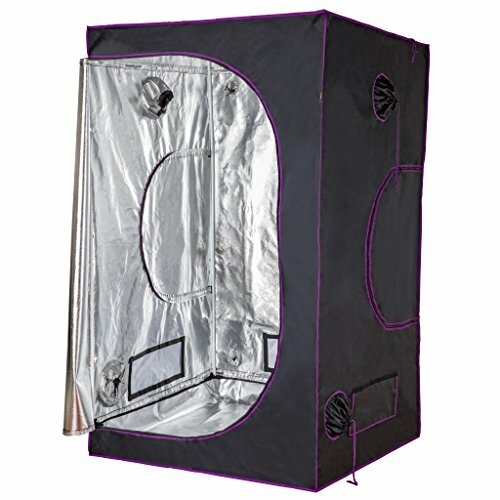 If you’re interested in cultivating herbs and other low-lying crops, this type of grow tent is perfect for you. Why spend more on high-end grow tents when you can get the same job done for less? That’s the kind of advantage that these tents offer. Grow tents are definitely important to indoor aquaponics/hydroponics growers because they keep out smells from the rest of the house and also thermo-regulate the plants’ surroundings, ensuring proper temperature and ideal growth parameters. How much are you willing to spend on a grow tent? A grow tent will act as the greenhouse for your plants so that the ambient temperature around the plants doesn’t fluctuate and any heat from the grow lights are limited to the area where the grow beds are actually located. Generally speaking, there are now more affordable grow tents for hydroponics/aquaponics growers so there’s no need to overspend. This is an excellent development indeed as grow tents are a priority for beginning hydroponics growers. How much space can you afford to dedicate to your entire setup? Remember – you would need to provide space not only for your new grow tent, but also to the nutrient solution reservoir. If you are planning to create an aquaponics culture setup, your system will include at least one fish tank and piping to deliver water to and from your grow beds. How well do you know the design of your hydroponics/aquaponics system? How well does it complement the use of an indoor grow tent? There are some hydroponics designs that require an overhead tank to be installed. Others require a sump tank to be placed directly below the grow beds so that a restricted channel can guide the water back to the fish tank or nutrient tank. Check the design of the system and figure out how you’re going to include the grow tent to the overall design. Of course, there’s always the possibility of modifying the existing system, adjust it, so that a grow tent can be used instead of a more open setup that isn’t space-restricted. Hydroponics projects are often accentuated by lots of accessories. Stands, dials, timers – all of these things require space. Knowing what type of accessories you will be using and how many of them will be going into the grow tent will ensure that you will be able to purchase the grow tent with the right size. Proper sizing should be done before purchase. Grow tents have dimensions and it is easy to estimate the space you need by simulating the design you want to implement. The good thing is that many grow tents can be extended vertically a foot or more if you need more vertical space. This feature is often built-in, or you can purchase extension poles from the manufacturer. The height of the grow tent should be adjustable, in the event that you need to add more lights, or if you need to adjust the height of the lights. There are also some instances when you will need to add more tiers to the main support frame so the grow tent can support more grow beds/cups. Grow lights can pump out massive amounts of infrared radiation inside your home or any indoor space. These lighting devices are like small suns, designed to mimic the natural radiation of the sun. Grow tents that aren’t made with quality fabric can become frayed more quickly over time. With constant exposure to heat and light radiating from powerful LED grow lights or HIDs, make sure that the grow tent you’ll be buying is sufficiently hardy for the task ahead. Now that you got an idea of what makes a good grow tent then hopefully you’ll find one that works best for your current grow setup!